India is not just only about Bollywood. The Indian television route is far more stretched than main stream movies. The leading ladies are the souls of these soap operas. They rule the television market and keep us entertained all day long. They are seen in comedy shows, dance shows, reality shows etc. other than merely soaps and serials. Here are our Top 10 Most Beautiful Actresses on Indian Television. We know Drashti Dhami as Geet from Geet- Hui Sabse Parayi, Dr. Muskaan from Dill Mill Gayye on Star One and latest Madhubala from Madhubala- Ek Ishq Ek Junoon on Colors TV. This beautiful leading actress also won the 6th season of Jhalak Dikhhla Jaa. According to Eastern Eye, Dhami ranked 12th on its list of World’s Sexiest Asian Woman for 2012. Sanaya Irani is considered as the queen of Indian Television. She is the heartthrob of millions in the country. She is known for her roles in Iss Pyar Ko Kya Naam Doon, Chanchan and Miley Jab Hum Tum. She also did a cameo in Fanna. Toral Rasputra is famous for her present leading role in Balika Vadhu as Anandi. She also played in serials like Dhoom Machaao Dhoom, Ek Nayi Chhoti Si Zindagi, Yahan Ke Hum Sikandar, Risshton Ki Dor and Kesariya Balam Aavo Hamare Des. Prior to Saraswatichandra Miss Grover was seen as Dr. Riddhima Gupta in Dill Mill Gayye (Star One) and Sneha Bajaj in Kasautii Zindagi Kay (Star Plus). This actress, model and leading television personality is also the heartbeat of millions in India. Nia Sharma is considered as the Sexiest Girl of Indian Television. With her cute style, beautiful figure and acting skills she has been able to with the heart of millions. Rashami Desai is an all-rounder. She is known for her roles in Uttaran, Pari Hoon Main and Ssshhhh…Phir Koi Ha. She has also acted in shows like Comedy Circus, Maha Sangram, Zara Nachke Dikha, Crime Patrol, Big Money, Kitchen Champion Season 2, “Comedy Ka Maha Muqabala” and Jhalak Dikhla Jaa. Sara Khan will always be known for her mind excellent role Sadhana Rajvansh in Sapna Babul Ka…Bidaai that aired on Star Plus. She also played Mona Gandhi in Ram Milaayi Jodi on Zee TV, appeared on Baat Hamari Pakki Hai on Sony TV as a dancer and seen in V The Serial on channel V. This winner of Miss Madhya Pradesh title in 2007 is getting ready for her debut in Bollywood with Dark Rainbow and Aman Ki Asha. Hina Khan won more than 18 awards as Akshara in the popular television soap Yeh Rishta Kya Kehlata Hai that air on Star Plus. Star Parivaar Awards, New Talent Awards and Indian Telly Awards are a few of the names she bagged till date. She is also seen as cameo in serials like Kayamath, Sapna Babul Ka…Bidaai, Chand Chupa Badal Mein and MasterChef India (season 3). 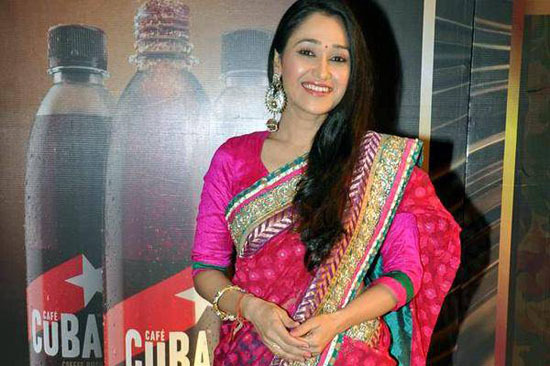 Disha Vakani is known for her accent and laughter in the popular comedy series Taarak Mehta Ka Ooltah Chashmah on SAB TV. She could bag the Indian Television Academy Awards for Best Actress in the comedy category for 2008 and 2009 consecutive years. She also acted in a few Bollywood films and TV commercials. People recognize Ankita as Archana Manav Deshmukh from the popular soap opera Pavitra Rishta that has been running since 2009 on Zee TV.